Here we are. It's Wednesday and we're doing it. My girl is so brave and she doesn't even know it. And, Rachel was right when she told me that we don't give her near enough credit. She is stronger than I ever knew. Yesterday was the first day I've really been able to eat since Mabel's surgery. Some say it's stress but it honestly felt like the flu. I have been achy and just not feeling good overall. But today is a new day and I feel pretty good. And so does Mabel. Did I mention she's amazing? We're really getting the hang of her feeds and giving medicine through her tube. That alone makes it worth it to me because we have still seen very VERY minimal seizure activity since being home. It's amazing! Oh, and...she has pooped every day! She hasn't done that EVER. It's because I can give her the right medicine to help her go and she doesn't puke it back up because it gets straight to her tummy. Oh, it's amazing. So as of today, I feel pretty great about the choice we made. She looks great, is feeling good and although I have had my moments--I feel confident in our decision. Who wants to see this girl be 20 pounds? I do! I do! I have been a writer for as long as I can remember. When I was little I would put words together in my head and then pen them to paper quickly, as not to forget. I have notebooks upon notebooks full of poetry and short stories that I wrote as just a small girl. And as a teenage girl I was addicted to quotes and anything that let me combine letters to form sentences. Now, I have a great opportunity that I cannot wait to share with you! Awhile ago I was contacted by a wonderful woman named Caroline. 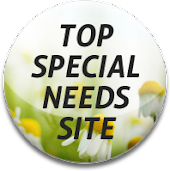 She shared with me about a ministry/website that is very dear to her heart and asked me to look at the site and read more about their mission. I visited Signposts for the first time and was immediately struck with such a sense of compassion and encouragement. This is a ministry that is devoted to serving families who have children with severe health problems or disabilities. They have many women who write for their site and each of them brings a different feel to the ministry as a whole. This is an incredible group of women. Each of them have a different and unique story but all of them have been brought together because at the core of their heart they want to reach out to families who are dealing with extraordinary circumstances and situations. It wasn't long before Caroline asked me to join this group of women and begin writing for their website. Of course, I couldn't contain my excitement because although I do not get paid to write, this is who I am. It's at the core of all I have ever wanted to do. I love it, it fulfills me and it is an outlet that I can't live without. So without hesitation I said yes and in some [probably embarrassing] giddy sort of way, I accepted her offer to write for signposts ministries! I will be posting there twice a month to start with. I will begin by sharing about our family and how we got to where we are with Mabel; our littlest love who is undiagnosed in a long process of testing and doctor visits. I'll be sure to let you all know when I make a post and direct you to the site. I am so excited to be a part of something so incredible!!! We are looking forward to trick or treating and Halloween events this weekend but until then, daddy & I are planning a scary movie fest after the kids go to bed tonight. [If] the kids go to bed tonight. Ramee - I am so happy for you & this opportunity! Also, YAY for Mabel. That is great news, what an amazing relief knowing she is getting her medicine.